Ahmadinejad Dismisses Clashes as "Not Important"
Iranian President Mahmoud Ahmadinejad said that election protesters were like disaffected soccer fans. Iranian authorities criticized international media reports and took steps to control the flow of information from independent news sources as anti-government protests raged in the country for a second day Sunday. President Mahmoud Ahmadinejad lashed out at the media shortly after he claimed victory in the election that critics contend was marked by widespread voter fraud. At a news conference Sunday, he accused international media of launching a "psychological war" against the country. Protesters in Tehran set fires and smashed store windows in response to Ahmadinejad's re-election as thousands of supporters gathered in the capital in celebration of the results. Ahmadinejad told the throngs gather that the highly criticized elections were honest and healthy, according to the BBC. "Some people want democracy only for their own sake," he said. "Some want elections, freedom, a sound election. They recognize it only as long as the result favors them." Earlier, Ahmadinejad dismissed the unrest — the worst in the decade in Tehran — as "not important" and insisted the results showing his landslide victory on Friday were fair and legitimate. A huge rally in his support was organized even as clashes flared around the capital. U.S. Vice President Joe Biden called Ahmadinejad's victory "questionable," on NBC's "Meet the Press" Sunday. While he said the results have to be accepted "for the time being," he added that "there's an awful lot of question about how this election was run," and promised a thorough review of the process. The violence spilling from the disputed results has pushed Iran's Islamic establishment to respond with sweeping measures that include deploying anti-riot squads around the capital and cutting mobile phone messaging and Internet sites used by the campaign of Ahmadinejad's election rival, Mir Hossein Mousavi. There's little chance that the youth-driven movement could immediately threaten the pillars of power in Iran — the ruling clerics and the vast network of military and intelligence forces at their command — but it raises the possibility that a sustained and growing backlash could complicate Iran's policies at a pivotal time. In Paris, French Foreign Minister Bernard Kouchner said he was "very worried" about the crackdown on protesters. "France regrets that instead of openness, there has been quite a brutal response. ... This will leave its mark, and the opposition will organize itself." In Israel, Prime Minister Benjamin Netanyahu called Iran "the greatest threat in the Middle East," in a policy speech Sunday, though he did not use Ahmadinejad's victory to argue against the creation of a Palestinian state as anticipated. So far, Mousavi has issued mixed signals through his Web site before it was shut down. He urged for calm but also said he is the legitimate winner of Friday's election and called on supporters to reject a government of "lies and dictatorship." He has not been seen in public since a news conference shortly after polls closed and may be under house arrest. In a second day of clashes, scores of young people shouted "Death to the dictator!" and broke the windows of city buses on several streets in central Tehran. They have burned banks, trash bins and piles of tires used as flaming barricades to block police. Along Tehran's Vali Asr St. — where pro-Mousavi activists held a huge pre-election rally last week — tens of thousands of people marched in support of Ahmadinejad, waving Iranian flags and shouting his name. In a news conference, Ahmadinejad called the level of violence "not important from my point of view" and likened it to the intensity after a soccer match. In Iran, "freedom is absolute," he said. 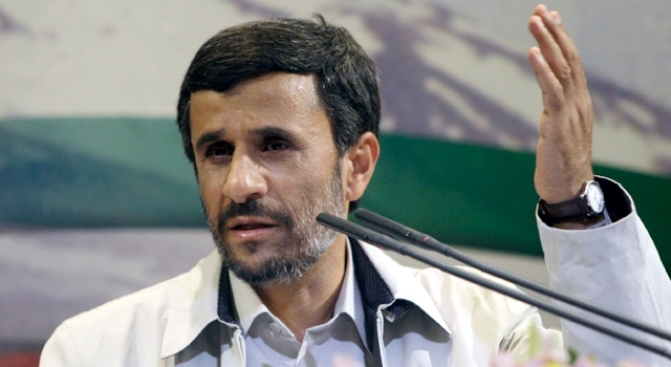 Ahmadinejad also accused foreign media of launching a "psychological war" against the country. Iranian authorities have asked some foreign journalists — in Iran to cover the elections — to prepare to leave. Nabil Khatib, executive news editor for Dubai-based news network Al Arabiya, said the station's correspondent in Tehran was given a verbal order Sunday from Iranian authorities that the office will be closed for one week. No reason was given for the order, but the station was warned several times Saturday that they need to be careful in reporting "chaos" accurately. On Saturday, Mousavi, a 67-year-old former prime minister, released a Web message saying he would not "surrender to this manipulation." Authorities responded with targeted detentions, apparently designed to rattle the leadership of Mousavi's "green" movement — the trademark color of his campaign. 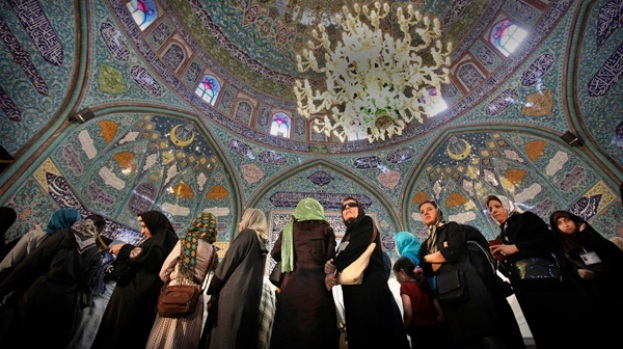 Iran's supreme leader, Ayatollah Ali Khamenei, closed the door for possible compromise. He could have used his near-limitless powers to intervene in the election dispute. But, in a message on state TV on Saturday, he urged the nation to unite behind Ahmadinejad, calling the result a "divine assessment." The U.S. has refused to accept Ahmadinejad's claim of a landslide re-election victory said it was looking into allegations of election fraud. There are no independent election monitors in Iran. U.S. Secretary of State Hillary Rodham Clinton said Saturday she hoped the outcome reflects the "genuine will and desire" of Iranian voters. The European Union also said it was "concerned about alleged irregularities" during Friday's vote. In Beirut, Lebanon's militant Hezbollah group — which is aided by Iran — congratulated Ahmadinejad and said the vote was conducted in an atmosphere of "freedom."